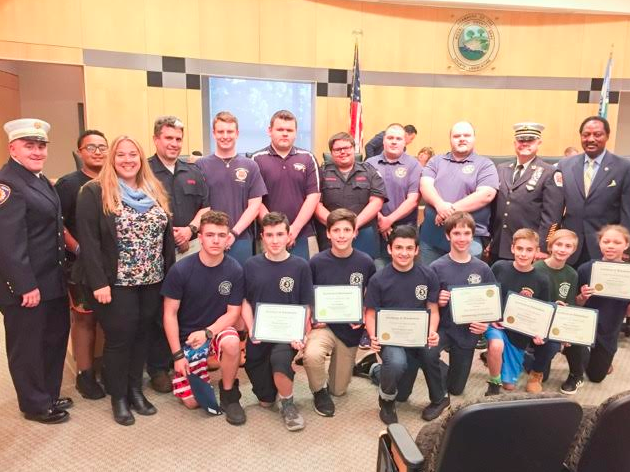 Students who completed the Rockland County Fire & EMS Youth Academy were honored by the Rockland County Legislature Tuesday, along with their instructors and others who helped to ensure the academy’s smooth operation. Rockland County Legislator Laurie Santulli formally recognized the honorees during a ceremony in the Legislative Chambers. Santulli has more than 20 years of volunteer service with the New City and Congers Fire Departments and was a speaker at the Fire & EMS Youth Academy graduation in April. Rockland relies on the hundreds of volunteers who make up the county’s 26 volunteer fire departments, as well as the Rockland County Haz Mat Team, the Rockland Regional Technical Rescue Team and numerous specialty teams within each department. Raian Alam, Andrew Bernaba, Aidan Carton, Elias Chkhikvadze, Kieran Dudek, John Durkin III, Adonis Espinal, Jack Gannon, Maxwell Goldberg, Jonathan Green, Connor Ippolito, Leilani Jackson, Gavin Kopf, Kenneth Kowalski, Daniel Lennon, Omar Lopez, Kenneth Louden, Jr., Peter Moger, Justin Pawelczyk, Dominic Raguso, Kinsey Reid, Tommy Santulli, Zach Schlissel, Courtney Schoenleber, Briana Sinnott, Scott Weaver, Jr., Danny Wynne. John Ahlf, Thomas Bierds, Rich Grady, Shawn Healy, Jerry Knapp, Andrew Kolesar, Damien Lennon, Daniel Moran, Patrick Pascullo, Sheryl Rose, Joseph Tisbe. Michael Barrish, Brandon Bates, Matt Bates, Jonathan Bublowski, Robert Condon, Matt Dennison, Shawn Farkas, Joanna Meyers, Scot M. Oser, Josh Sheridan, Nick Winterborne. Central Nyack, Congers, Nanuet, Orangeburg, Piermont, Sloatsburg, Tallman, West Haverstraw, West Nyack.